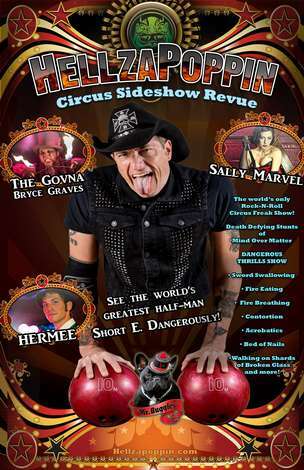 Hellzapoppin Circus SideShow Revue is a world renown theatrical Rock-N-Roll circus stunt-show where some of the deadliest stunts in live entertainment are performed to a LIVE audience with emphatic rock music. You’ve seen them on AMC’s Freak Show, Ripley’s Believe It Not, Guinness World Records, Discovery Channel, Travel Channel and more. This vaudeville freak show of wonder features LIVE stunts like: fire eating & fire breathing, bed of nails, the human block-head, hand balancing & acrobatic stunts, 1 of only 15 female sword swallowers in the world, human oddities & curiosities like a real-live half-man who walks on his bare-hands in broken shards of glass! For more info check out Hellzapoppin.com.